Two weeks ago, I came across an email from my sister while cleaning out my inbox. She’d sent it earlier in the summer, and I forgot all about it–even though the subject line read: Chopped Contest! You should enter this! When I opened the email and clicked on the link, I could’ve kicked myself for not entering the Chopped At Home Challenge sooner. I only had two days to come up with a recipe, and not just any recipe, but a recipe that incorporated pork tenderloin, broccoli, grape tomatoes and Sargento’s 4-State Cheddar Cheese Blend. This was not my ideal combination of ingredients, especially since I didn’t have the time to come up with a recipe and test it a couple of times before the contest ended. But thank God for small favors. I had 3 out of the 4 ingredients on hand: broccoli, grape tomatoes and pork tenderloin. Although there was cheddar cheese in the fridge, one of the submission requirements was that I had to take a picture of my dish with the Sargento cheese blend package. I picked up a bag of the shredded cheese at the grocery store and returned home with no idea what I was going to make. I had a pristine pantry and no recipe. I noticed the industrial-sized can of tuna fish that I bought for some unknown reason and tuna melts popped into my head. This idea turned into shredded pork melts, which sounded good to me, and me alone. When I told the fellas my idea for a recipe, they crunched up their faces like I just offered them a bowl of cat food for dinner. Since the three amigos were no help, I went back to the pantry and grabbed a handful of tortilla chips. This time I stayed focused and chomped on the chips while I tried to come up with a recipe for the challenge. I remember thinking I should’ve bought some cheese sauce when I went to the store earlier that day. And then it hit me. Nachos! I can make nachos! I went back to the fellas with my revelation, and they gave me a tentative thumbs up. But they were hung up on the combination of tortilla chips and broccoli. “Trust me,” I said, “the cheese sauce will bring everything together.” I initially wanted to make a fondue because it’s silky and luxurious, and a little more elegant than a traditional thick and heavy nacho sauce. I didn’t have any white wine for the fondue, but I had cream cheese, which I use in my stove-top mac and cheese to keep the sauce creamy. In true Andria Gaskins fashion, I didn’t read all the rules and jumped right into making my dish. After preparing the tenderloin in a quick braise, I read the rules and discovered that I was suppose to use a grill in the preparation. %$#! Fortunately, I had two tenderloins and just massaged the pork with a barbecue rub and threw it on a grill pan for a few minutes. I whipped the sauce up in no time, then it was just a matter of putting it all together. When I presented the platter to Big Daddy, he dutifully accepted his obligation as head guinea pig. He picked the chip that had the least amount of filling on it and took a bite. He reached for a second chip, then a third. He removed the platter from my hands and said, “Is this what I’m having for dinner?” He looked so cute with cheese sauce at the corner of his mouth. “This is good. Good job.” He gave me a high five and kept on eating my creation. Eureka! I done struck gold! Not only did I make nachos and broccoli taste good, I brought some healthy and upscale to pork nachos. 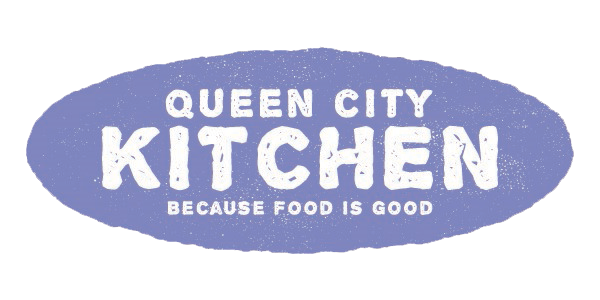 I submitted my recipe online, and the next day it was approved for the voting phase of the Chopped at Home Challenge. Turns out voting is 40% of the final score. Judges provide the remaining 60%. Now all I have to do is get people to vote for my Pork Nachos with Tomato Broccoli Fondue. 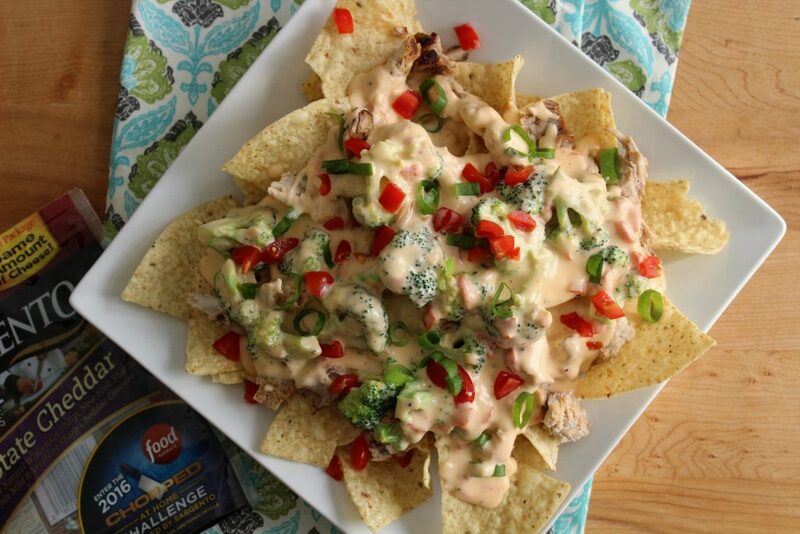 PLEASE VOTE FOR MY PORK NACHOS WITH TOMATO BROCCOLI FONDUE! You can vote up to 5 times a day until Monday, August 22, 2016. Click the VOTE button 5 times in a row until a message pops up that says come back tomorrow. That’s it! The two top-scoring entries will each win $5,000 and a trip to New York to compete in the final round. Thanks for your vote and support. Wish me luck! Rub the barbecue spice all over the pork tenderloin and wrap in plastic wrap. Refrigerate overnight. Preheat oven to 350 degrees. Heat an oven-safe grill pan over medium-high heat. Brush the pan with oil and add the pork tenderloin. Sear all four sides for about 2 minutes each. Transfer the pan to oven, and bake for about 20 to 25 minutes. Remove the pan from the oven and let the tenderloin rest for 10 minutes. Meanwhile prepare the broccoli. Heat the olive oil in a large skillet over medium heat. Add the broccoli and cook until bright green, about 3 minutes, stirring constantly. Add the chicken broth and season with salt, pepper and pepper flakes. Cook until just tender, about 4 minutes. Set aside until ready to use. Transfer the pork to a cutting board and allow to stand for 5 minutes. Drain the cooking liquid into a liquid measuring cup. Discard the solids. Shred the pork into large chunks and toss in a medium bowl with about ½ cup cooking liquid to coat. To make the cheese sauce, melt the butter in a large pot over medium heat. Add the shallots, garlic and tomatoes, and cook until tender, about 3 minutes. Season with salt and pepper. Whisk the milk, cream and cornstarch in a medium bowl until combined. Pour the liquid into the pot and bring to a gentle simmer. Do not boil. Reduce the heat to low and stir in the cream cheese until melted. Gradually add the cheddar cheese, stirring until melted. Fold the prepared broccoli into the sauce. To assemble the nachos, arrange the tortilla chips on a large serving platter. Pile with warm pulled pork. Drizzle broccoli cheddar sauce over the top. Garnish with chopped tomatoes and green onions. 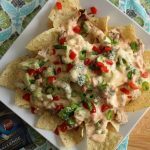 This entry was posted in Appetizers, Entree, Recipes, Snacks and tagged broccoli, Chopped At Home, Chopped At Home Challenge, Food Network, grape tomatoes, nachos, pork, Sargento, Sargento 4-State Cheddar Cheese Blend on August 7, 2016 by Andria Gaskins.